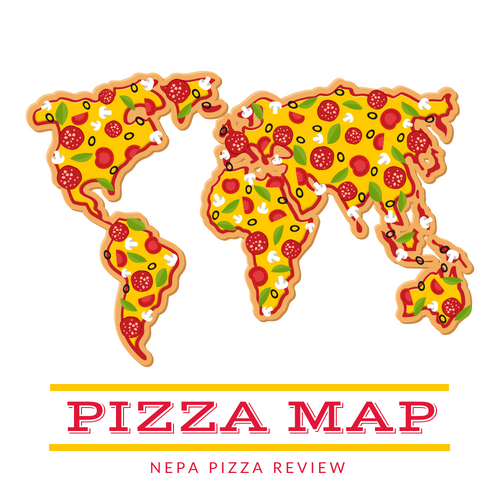 Nicholas Pizza has been on my radar since I started this website nearly 2 years ago. I've had many friends recommend that I get there to try their unique pizza, and one in particular who frequents the pizzeria once per week has been consistently reminding me to try it out. One day, I was finally down in Scranton and decided that it was time to finally try this place out. I hit up my resident Nicholas expert and he recommended that I get a plain pizza and a hot wing pizza. I was dining alone, so I wasn't sure I wanted 2 pizzas, but I learned that they were small 12" pies, so it would be manageable for me to get a pair of them. I called ahead to dine in, as my insider told me to eat it there. The friendly voice on the phone told me the pizza would be ready in 15 minutes, so I started my journey across the city wondering what this pizza would be like. Whenever someone describes a pizza as "unique" I get super excited, and lately I haven't found many truly distinctive pizzas (I've found great pizzas, just not all that different from the rest). Needless to say, I drove down Washington Avenue with great anticipation. I spotted the prison, and found my destination directly across the street just as I had been instructed. When I walked in, I thought to myself that this pizzeria was a cool throwback to a simpler time - several decades ago. Somehow I felt that history was preserved in this little slice of Scranton, and I felt at ease as I walked in to sample this pizza. The whole kitchen is open, so I was able to see the whole operation. Noticing that the dough was fresh, but the small round thin shells are prepared ahead of time. I could see the pizzas were made in pans and tossed into the oven for proper cooking. 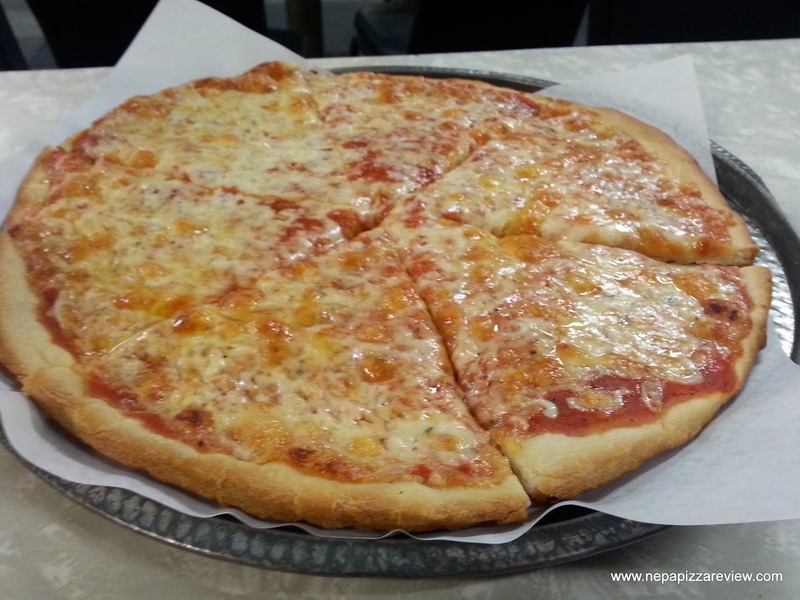 I love checking out pizza kitchens - it just fascinates me! Anyway, I grabbed my pizza and sat down at one of the 8-10 tables to enjoy the pie. I was starving, so this 12" plain pie was going to be dinner for one, even though it could probably feed two people easily. I ordered my hot wing pizza to go, so I watched that pie get prepared as I was evaluating my first pizza. The pie was simple, with a very crunchy crust, a slightly zesty sauce with a hint of spice, and a sharp cheddar cheese (or similar) with just the right amount of grease. From the first bite, I recognized this pizza as my next guilty pleasure because the flavors were incredible, and the whole pizza just worked. The crown jewel of the whole pie was the crunchy crust. Notice I used the term CRUNCHY, not crispy. 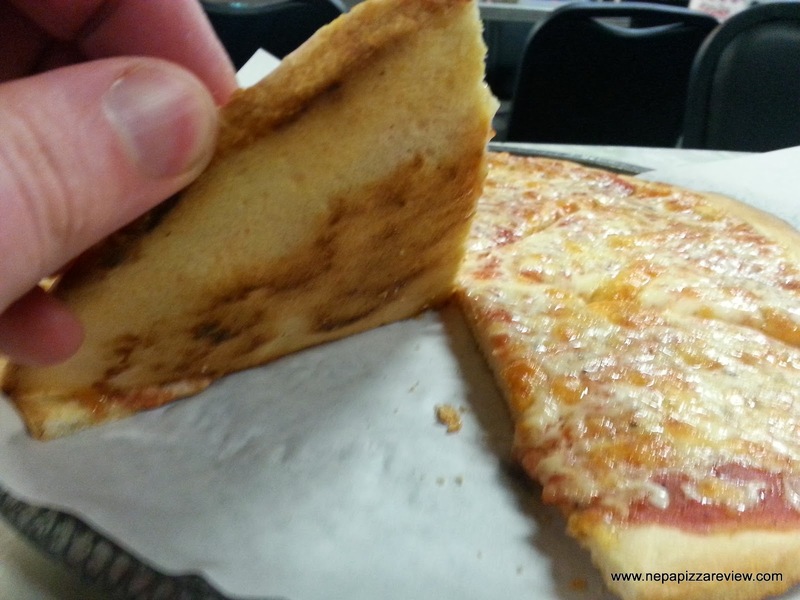 This crust is crunchy throughout, much the same way that a cracker or a pretzel (if it were flat) would be. I was totally buying into this pizza more and more, bite after bite. Regardless of how this pizza rated on my "snob meter" I was enjoying the heck out of this thing and experiencing all that Nicholas' had to offer. Of course I was in a hurry as I always am, but if I wasn't, I could have sat and appreciated the simple community atmosphere for hours. As my friends had said, you have to experience Nicholas' pizza, and after all this time had passed, I'm glad I finally did. After I was done with my plain pizza, I took my hot wing to go, and I must say, this pizza was fantastic as well. The crust was super crunchy, both when I took my first bite, and 24 hours later when I ate another slice cold. The cheese was awesome, there was plenty of chicken, the flavoring was very nice, and the sauce wasn't too hot which I know is a concern for many people. 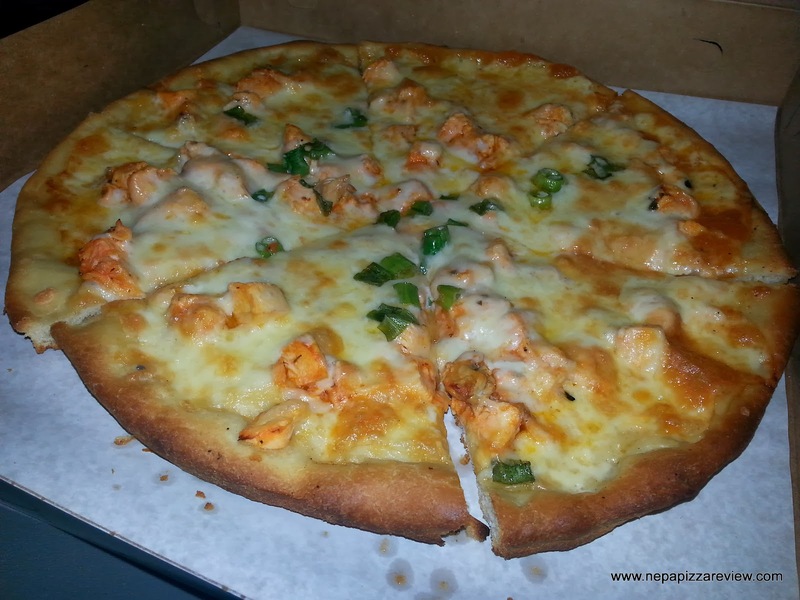 I'm only rating the cheese pizza, but it's safe to say after trying both, my recommendation remains the same as what was recommended to me - get a plain and a hot wing! Both will cost you a total of $17.00, and it's totally worth it! 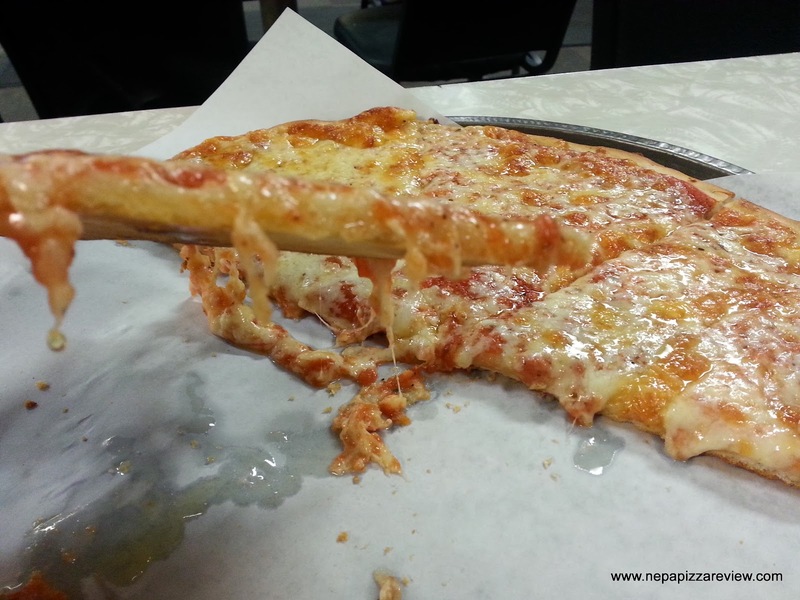 The Bottom Line is that I'm frustrated with myself for not making a better effort in getting to Nicholas Pizza Shop sooner, because it's a true historical landmark (to me) that is slinging unique little pizzas that people are bound to love. Judging by the number of recommendations I received on this one, people already do love it. So thanks to those of you who sent this one in, with a shout out to MC and JA for staying after me on this one!